We Have Lift-Off! SparkPost Out of Beta. Blog Products Cloud We Have Lift-Off! 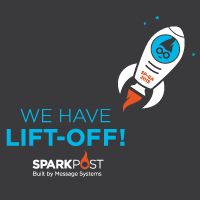 It is our great pleasure to announce that SparkPost, Built by Message Systems, has completed beta and is now available to everyone. As was announced today by Message Systems, we are thrilled at the reception we’ve received, both in the marketplace and in the industry in general. Some of the great companies who’ve already signed up for SparkPost are Pinterest, Zillow, Bisnow, Iterable, Circonus and Movoto, just to name a few. As a reader of this blog, you are already familiar with SparkPost.com, our self-service, pay-as-you-go service that allows developers at companies of all sizes to easily integrate email delivery into their web and mobile applications in minutes using a credit card. However, what if you’re an organization that’s already sending high volumes of email and need to upgrade to a service that provides unbeatable delivery and engagement, but in a dedicated instance with high guaranteed burst rates? To meet those needs we have also simultaneously launched SparkPost Elite. SparkPost Elite provides customers with dedicated servers and IP addresses so you have full control over your sending capabilities and reputation, without the hassle of managing in-house servers and other hardware. SparkPost Elite also provides the ability to send SMS text and push notifications for mobile apps. With SparkPost Elite you get a dedicated Technical Account Manager who provides reviews and advice for improvements, plus dedicated support staff with 24×7 monitoring of your service. We’ll manage the initial set-up and configure the service to meet your needs, with custom messaging policy implemented if you need it, so you’re up and sending in no time. All of us at SparkPost and Message Systems are excited to be able to provide these new cloud email delivery services to meet the needs of customers of all sizes. As we go forward we’ll be working hard to provide additional features and functions as we grow. In the meantime, stay tuned here for more news, announcements and additions as they happen.